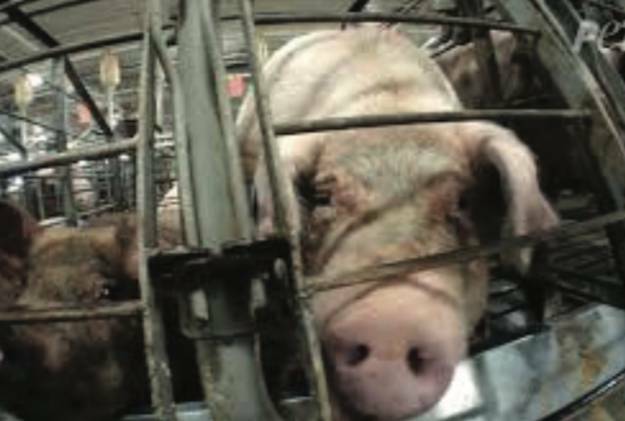 A federal judge in Utah ruled that a state law which made it illegal to lm what happens at farms and slaughterhouses is unconstitutional. These laws -- which are called “ag gag laws” -- are attempts to hide what’s happening on farms and slaughterhouses and criminalize efforts to bring the truth to light by photographing or videoing what is occurring or going undercover to gather information. In 2015, Wisconsin Rep. Lee Nerison (R-Westby) announced that he planned to introduce a similar ag gag law after an undercover investigation secretly lmed footage showing workers kicking and punching cows and using garden shears to cut off cows’ tails at Andrus Dairy Farm in Shawano County, Wisconsin. Soon after Utah’s 2012 ag gag law was passed, Amy Meyer, an activist with Utah Animal Rights Coalition (UARC), became the rst person to be prosecuted under one of these laws. Amy was charged with agricultural-operation interference because she videotaped a cow being pushed with a bulldozer at a meat packing company in Utah. The cow was unable to walk and was treated like trash. Amy made the recording while standing on public property. Her case gained national attention and the charges were dismissed. But that is not the end of the story. Later that year, Amy, with the help of Animal Legal Defense Fund (ALDF) and PETA challenged the constitutionality of the Utah statute. On July 7, US District Judge Robert Shelby issued a landmark ruling that struck down the law on the grounds that it violates the First Amendment. “The court’s ruling recognizes what PETA has said all along, which is that Americans have a right to know that workers in the meat industry kick pigs in the face, stomp on chickens and turkeys, and smash piglets’ heads against concrete oors,” said PETA’s Director of Animal Law, Jared Goodman. With the Utah ruling, attempts to create an ag gag law in Wisconsin or any other state will most likely fail. These undercover investigations expose the reality of animal agriculture and open the public’s eyes to what happens behind closed doors. Citizens must have access to the truth in order to make their own informed decisions about the industry. The Utah ruling makes it clear that it is perfectly legal to get a job on a farm, in a lab, a slaughterhouse, a circus, a zoo, anywhere, under a false pretense in order to document suspected animal abuse.